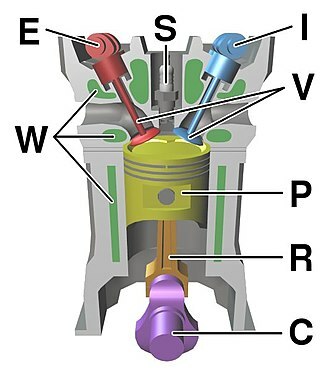 In an internal combustion engine, the cylinder head (often informally abbreviated to just head) sits above the cylinders on top of the cylinder block. It closes in the top of the cylinder, forming the combustion chamber. This joint is sealed by a head gasket. In most engines, the head also provides space for the passages that feed air and fuel to the cylinder, and that allow the exhaust to escape. The head can also be a place to mount the valves, spark plugs, and fuel injectors. 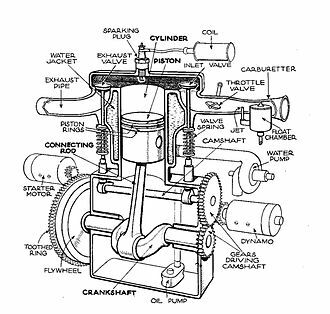 In a flathead or sidevalve engine, the mechanical parts of the valve train are all contained within the block, and a 'poultice head' may be used that is essentially a simple metal plate bolted to the top of the block. Keeping all moving parts within the block has an advantage for physically large engines in that the camshaft drive gear is small and so suffers less from the effects of thermal expansion in the cylinder block. With a chain drive to an overhead camshaft, the extra length of chain needed for an overhead cam design could give trouble from wear and slop in the chain without frequent maintenance. Early sidevalve engines were in use at a time of simple fuel chemistry, low octane ratings and so required low compression ratios. This made their combustion chamber design less critical and there was less need to design their ports and airflow carefully. One difficulty experienced at this time was that the low compression ratio also implied a low expansion ratio during the power stroke. 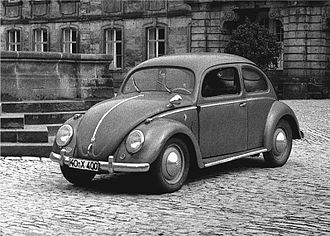 [note 1] Exhaust gases were thus still hot, hotter than a contemporary engine, and this led to frequent trouble with burnt exhaust valves. A major improvement to the sidevalve engine was the advent of Ricardo's turbulent head design. This reduced the space within the combustion chamber and the ports, but by careful thought about the airflow paths within them it allowed a more efficient flow in and out of the chamber. Most importantly, it used turbulence within the chamber to thoroughly mix the fuel and air mixture. This, of itself, allowed the use of higher compression ratios and more efficient engine operation. The limit on sidevalve performance is not the gas flow through the valves, but rather the shape of the combustion chamber. With high speed engines and high compression, the limiting difficulty becomes that of achieving complete and efficient combustion, whilst also avoiding the problems of unwanted pre-detonation. The shape of a sidevalve combustion chamber, being inevitably wider than the cylinder to reach the valve ports, conflicts with achieving both an ideal shape for combustion[note 2] and also the small volume (and low height) needed for high compression. 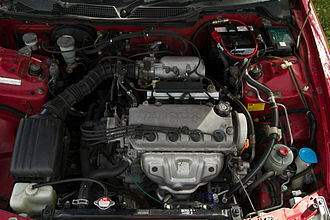 Modern, efficient engines thus tend towards the pent roof or hemi designs, where the valves are brought close in to the centre of the space. Where fuel quality is low and octane rating is poor, compression ratios will be restricted. 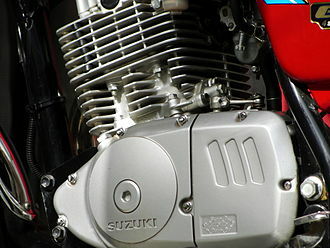 In these cases, the sidevalve engine still has much to offer. Particularly in the case of the developed IOE engine for a market with poor fuels, engines such as Rolls-Royce B series or the Land-Rover use a complicated arrangement of inclined valves, a cylinder head line at an angle to the bore and corresponding angled pistons to provide a compact combustion chamber approaching the near-hemispherical ideal. Such engines remained in production into the 1990s, only being finally replaced when the fuels available 'in the field' became more likely to be diesel than petrol. Internally, the cylinder head has passages called ports or tracts for the fuel/air mixture to travel to the inlet valves from the intake manifold, and for exhaust gases to travel from the exhaust valves to the exhaust manifold. In a water-cooled engine, the cylinder head also contains integral ducts and passages for the engines' coolant—usually a mixture of water and antifreeze—to facilitate the transfer of excess heat away from the head, and therefore the engine in general. In the overhead valve (OHV) design, the cylinder head contains the poppet valves and the spark plugs, along with tracts or 'ports' for the inlet and exhaust gases. 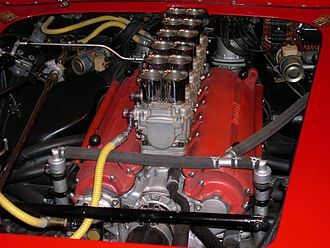 The operation of the valves is initiated by the engine's camshaft, which is sited within the cylinder block, and its moment of operation is transmitted to the valves' pushrods, and then rocker arms mounted on a rocker shaft—the rocker arms and shaft also being located within the cylinder head. In the overhead camshaft (OHC) design, the cylinder head contains the valves, spark plugs and inlet/exhaust tracts just like the OHV engine, but the camshaft is now also contained within the cylinder head. The camshaft may be seated centrally between each offset row of inlet and exhaust valves, and still also utilizing rocker arms (but without any pushrods), or the camshaft may be seated directly above the valves eliminating the rocker arms and utilizing 'bucket' tappets. The number of cylinder heads in an engine is a function of the engine configuration. Almost all inline (straight) engines today use a single cylinder head that serves all the cylinders. A V (or Vee) engine has two cylinder heads, one for each cylinder bank of the 'V'. 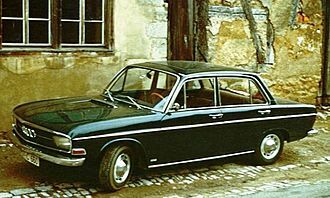 For a few compact 'narrow angle' V engines, such as the Volkswagen VR6, the angle between the cylinder banks is so narrow that it uses a single head spanning the two banks. A flat engine (basically a V engine, where the angle between the cylinder banks is now 180°) has two heads. Most radial engines have one head for each cylinder, although this is usually of the monobloc form wherein the head is made as an integral part of the cylinder. 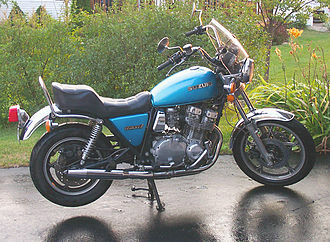 This is also common for motorcycles, and such head/cylinder components are referred-to as barrels. Some engines, particularly medium- and large-capacity diesel engines built for industrial, marine, power generation, and heavy traction purposes (large trucks, locomotives, heavy equipment etc.) have individual cylinder heads for each cylinder. This reduces repair costs as a single failed head on a single cylinder can be changed instead of a larger, much more expensive unit fitting all the cylinders. Such a design also allows engine manufacturers to easily produce a 'family' of engines of different layouts and/or cylinder numbers without requiring new cylinder head designs. The design of the cylinder head is key to the performance and efficiency of the internal combustion engine, as the shape of the combustion chamber, inlet passages and ports (and to a lesser extent the exhaust) determines a major portion of the volumetric efficiency and compression ratio of the engine. DOHC, Twin-Cam, Cammer Head Head Head Allows optimum positioning of the valves for a crossflow cylinder head. OHC, SOHC, Single-Cam, "Single-Jingle", Cammer Head Head Head Widely used for cars in recent decades, but increasingly superseded by DOHC. A single overhead camshaft (SOHC) cylinder head from a Honda D15A3. A double overhead camshaft (DOHC) cylinder head from a Honda K20Z3. The bottom (left) and top (right) of a Malossi cylinder head for single-cylinder, two-stroke scooters. Hole in the middle for the spark plug, four holes for the cylinder bolt posts. Overhead view of an air-cooled cylinder head from a Suzuki GS550 showing dual camshafts, drive sprockets and cooling fins. The cylinder head from a GMC van. The valves and part of the exhaust manifold are visible. ^ The work done on the piston during the expansion stroke is limited by how much stroke there is in which to achieve it. Assembly of Ford Duratec Engine 3D simulation—video showing construction and operation of a four-cylinder internal combustion engine. A flat engine is an internal combustion engine with horizontally-opposed cylinders. Typically, the layout has cylinders arranged in two banks on either side of a crankshaft and is otherwise known as the boxer. The concept was patented in 1896 by engineer Karl Benz, who called it the contra engine, a boxer engine should not be confused with the opposed-piston engine, in which each cylinder has two pistons but no cylinder head. Also, if an engine is canted 90 degrees into the horizontal plane. Horizontal inline engines are common in industrial applications such as underfloor mounting for buses. True boxers have each crankpin controlling only one piston/cylinder while the 180° engines, the 180° engine, which may be thought of as a type of V engine, is quite uncommon as it has all of the disadvantages of a flat engine, and few of the advantages. 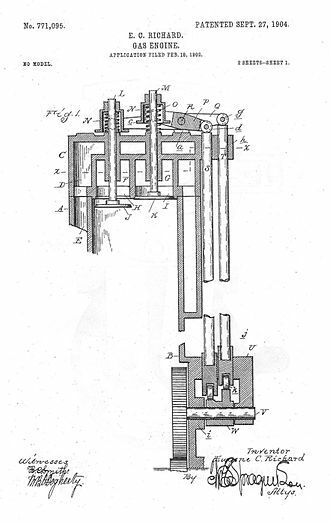 In 1896, Karl Benz invented the first internal combustion engine with opposed pistons. He called it the engine, as the action of each side opposed the action of the other. This design has since called the boxer engine because each pair of pistons moves in. The boxer engine has pairs of pistons reaching TDC simultaneously and these engines do not require a balance shaft or counterweights on the crankshaft to balance the weight of the reciprocating parts, which are required in most other engine configurations. However, in the case of engines with fewer than six cylinders. Other engine configurations with natural dynamic balance include the straight-six, the straight-eight, the V12, Boxer engines tend to be noisier than other common engines for both intrinsic and other reasons. In cars, valve clatter from the compartment is not damped by air filters or other components. Multi-cylinder boxer layouts have proved to be suited as light aircraft engines, as exemplified by Continental, Rotax, Jabiru. An important factor in aircraft use is the flat engines absence of vibration, general aviation aircraft often use air-cooled flat-four and flat-six engines made by companies such as Lycoming and Continental. Exhaust gas or flue gas is emitted as a result of the combustion of fuels such as natural gas, petrol, biodiesel blends, diesel fuel, fuel oil, or coal. According to the type of engine, it is discharged into the atmosphere through an exhaust pipe, flue gas stack and it often disperses downwind in a pattern called an exhaust plume. A2013 study by MIT indicates that 53,000 early deaths occur per year in the United States alone because of vehicle emissions. According to another study from the university, traffic fumes alone cause the death of 5,000 people every year just in the United Kingdom. The largest part of most combustion gas is nitrogen, water vapor, and carbon dioxide, Exhaust gas temperature is important to the functioning of the catalytic converter of an internal combustion engine. It may be measured by an exhaust gas temperature gauge, EGT is a measure of engine health in gas-turbine engines. During the first two minutes after starting the engine of a car that has not been operated for several hours, inefficient catalytic converter under cold conditions, Catalytic converters are very inefficient until up to their operating temperature. This time has much reduced by moving the converter closer to the exhaust manifold. The small converter handles the start-up emissions, which enough time for the larger main converter to heat up. Further improvements can be realised in many ways, including heating, thermal battery, chemical reaction preheating, flame heating. The requirements were phased in beginning with 2004 vehicles and all new cars, in spark-ignition engines the gases resulting from combustion of the fuel and air mix are called exhaust gases. The composition varies from petrol to diesel engines, but is around these levels, The 10% oxygen for diesel is likely if the engine was idling and it is much less if the engine is running under load. People exposed to it should wear a gas mask, in aircraft gas turbine engines, exhaust gas temperature is a primary measure of engine health. Typically the EGT is compared with an engine power indication called engine pressure ratio. For example, at full power EPR there will be a maximum permitted EGT limit, once an engine reaches a stage in its life where it reaches this EGT limit, the engine will require specific maintenance in order to rectify the problem. Sir Harry Ralph Ricardo was one of the foremost engine designers and researchers in the early years of the development of the internal combustion engine. Ricardo was descended from a brother of the political economist David Ricardo. He was one of the first people in England to see an automobile when his grandfather purchased one in 1898 and he was from a relatively wealthy family and educated at Rugby School. In October 1903 he joined Trinity College, Cambridge as an engineering student. Ricardo had been using tools and building engines since the age of ten, in 1911 Ricardo married Beatrice Bertha Hale, an art student at the Slade School of Art, in London. Her father, Charles Bowdich Hale, was the Ricardos family doctor and they had three daughters, and lived most of their married life at Lancing and Edburton in West Sussex. His engine had a cylinder, and was the heaviest entered. He was persuaded to join the Professor of Mechanism and Applied Mechanics, Bertram Hopkinson and he graduated with a degree in 1906 and spent another year researching at Cambridge. Ricardo is said by Percy Kidner, Co-managing director of Vauxhall, before graduation, Ricardo had designed a two-stroke motorcycle engine to study the effect of mixture strength upon the combustion process. When he graduated, the firm of Messrs Lloyd and Plaister expressed interest in making the engine. Ricardo produced designs for two sizes, and the one sold about 50 engines until 1914, when the war halted production. In 1909 he designed a two-stroke 3. 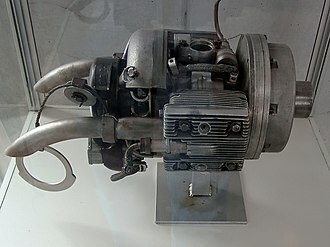 3-litre engine, for his cousin Ralph Ricardo, the engine was to be used in the Dolphin car. The cars were made, but it became apparent that they cost more to make than the selling price. The company fared better making two-stroke engines for fishing boats, in 1911 the firm collapsed and Ralph departed for India. Ricardo continued to design engines for electric lighting sets, these were produced by two companies until 1914. In 1915 Ricardo set up a new company, Engine Patents Ltd. which developed the engine that would eventually be used in the first successful tank design, the Daimler sleeve-valve engine used in the Mark I created copious amounts of smoke, which easily gave away its position. A V engine, or Vee engine is a common configuration for an internal combustion engine. The cylinders and pistons are aligned, in two planes or banks, so that they appear to be in a V when viewed along the axis of the crankshaft. The Vee configuration generally reduces the engine length and weight compared to an equivalent inline configuration. The first V-type engine, a 2-cylinder vee twin, was built in 1889 by Daimler, by 1903 V8 engines were being produced for motor boat racing by the Société Antoinette to designs by Léon Levavasseur, building on experience gained with in-line four-cylinder engines. In 1904, the Putney Motor Works completed a new V12 marine racing engine – the first V12 engine produced for any purpose. Usually, each pair of corresponding pistons from each bank of cylinders share one crankpin on the crankshaft, some V-twin engine designs have two-pin cranks, while other V configurations include split crank-pins for more even firing. V-engines are generally more compact than straight engines with cylinders of the same dimensions, various cylinder bank angles of Vee are used in different engines, depending on the number of cylinders, there may be angles that work better than others for stability. A locomotive or engine is a rail transport vehicle that provides the motive power for a train. A locomotive has no payload capacity of its own, and its purpose is to move the train along the tracks. In contrast, some trains have self-propelled payload-carrying vehicles and these are not normally considered locomotives, and may be referred to as multiple units, motor coaches or railcars. The use of these vehicles is increasingly common for passenger trains. Traditionally, locomotives pulled trains from the front, push-pull operation has become common, where the train may have a locomotive at the front, at the rear, or at each end. Prior to locomotives, the force for railroads had been generated by various lower-technology methods such as human power, horse power. The first successful locomotives were built by Cornish inventor Richard Trevithick, in 1804 his unnamed steam locomotive hauled a train along the tramway of the Penydarren ironworks, near Merthyr Tydfil in Wales. Although the locomotive hauled a train of 10 long tons of iron and 70 passengers in five wagons over nine miles, the locomotive only ran three trips before it was abandoned. Trevithick built a series of locomotives after the Penydarren experiment, including one which ran at a colliery in Tyneside in northern England, the first commercially successful steam locomotive was Matthew Murrays rack locomotive, built for the narrow gauge Middleton Railway in 1812. This was followed in 1813 by the Puffing Billy built by Christopher Blackett and William Hedley for the Wylam Colliery Railway, Puffing Billy is now on display in the Science Museum in London, the oldest locomotive in existence. In 1814 George Stephenson, inspired by the locomotives of Trevithick. He built the Blücher, one of the first successful flanged-wheel adhesion locomotives, Stephenson played a pivotal role in the development and widespread adoption of steam locomotives. His designs improved on the work of the pioneers, in 1825 he built the Locomotion for the Stockton and Darlington Railway, north east England, which became the first public steam railway. In 1829 he built The Rocket which was entered in and won the Rainhill Trials and this success led to Stephenson establishing his company as the pre-eminent builder of steam locomotives used on railways in the United Kingdom, the United States and much of Europe. Cylinder head porting refers to the process of modifying the intake and exhaust ports of an internal combustion engine to improve the quality and quantity of the air flow. Cylinder heads, as manufactured, are usually due to design. Porting the heads provides the finely detailed attention required to bring the engine to the highest level of efficiency, more than any other single factor, the porting process is responsible for the high power output of modern engines. Daily human experience with air gives the impression that air is light, however, an engine running at high speed experiences a totally different substance. In that context, air can be thought of as thick, elastic, pumping it is a major problem for engines running at speed, so head porting helps to alleviate this. For major modifications the ports must be welded up or similarly built up to add material where none existed, the Ford two-liter shown above in stock trim was capable of delivering 115 horsepower@5500 rpm for a BMEP of 136 psi. Contrast this with the Pro Stock ports shown below and this aftermarket racing GM Pro Stock head was capable of 1300 horsepower@9500 rpm with a BMEP of 238 psi. Since BMEP is an excellent efficiency measure and closely related to volumetric efficiency, in fact a BMEP of 238 puts it near the top of the racing engine world. It is close to the limit for a naturally aspirated gas-burning engine, formula 1 four-valve/cylinder engines typically achieve BMEP values of 220 psi. Of course cam profiles, engine rpm, engine height constraints and other limitations play a role in this difference as well, when the valve opens, the air doesn’t flow in, it decompresses into the low-pressure region below it. All the air on the side of the moving disturbance boundary is completely isolated and unaffected by what happens on the downstream side. The air at the entrance does not move until the wave reaches all the way to the end. It is only that the runner can begin to flow. Up until that point all that can happen is the higher pressure gas filling the volume of the runner decompresses or expands into the low-pressure region advancing up the runner. Ford 289 K-code engine in a Shelby GT 350: The radiator hose connects to the intake manifold, a telltale Windsor feature. Dissected modern spark plug showing the one-piece sintered alumina insulator. The lower portion is unglazed. What looks like exhaust from jet engines, is actually contrail. (Jet flying over the United States Air Force Academy in Colorado Springs, Colorado). GM P-series bus, made in the late 1950s, still working in Conchillas, Uruguay (2011). Comparison of a stock intake manifold for a Volkswagen 1.8T engine (top) to a custom-built one used in competition (bottom). In the custom-built manifold, the runners to the intake ports on the cylinder head are much wider and more gently tapered. This difference improves the volumetric efficiency of the engine's fuel/air intake. Lower intake manifold on a 1999 Mazda Miata engine, showing components of a variable length intake system. A cylinder head from a Honda K20Z3. Components of the i-VTEC system can be seen. An example of a poorly performing port, a mold of the ports of a Ford two-liter head destined for use in Formula 2000 racing. It is shown as manufactured with the intake port on the right. "Topping up" the antifreeze solution in a car's cooling system is a routine maintenance item for most modern cars.